The kundalini has become more and more frequent in the new age media over the years. What is it? How does it function? There are many would-be gurus who claim to know all about kundalini and have the answers. There is kundalini yoga. There are research foundations and networks. I cannot sit in judgment of any of them. I can only provide my own ideas based on my own research and experience. My kundalini became fully activated in one fell swoop on an October night in 1973. It has been an adventure ever since. I particularly followed the books by Gopi Krishna, whose expository writings and poetry spoke volumes to me. Krishna had researched the kundalini in India as a modern student rather than one steeped in the traditional and mythological aspects of kundalini. In fact, Krishna was advocating a scientific research project to measure the activity of kundalini, to observe its effects in the body, and to create a body of scientific theory about it. The path to kundalini activation is a slow and challenging effort. It requires a capacity for mental concentration, physical health and stamina, emotional balance, and spiritual guidance. Otherwise, if any one of those faculties is not present, the pursuit of an active kundalini can lead to illness, confusion, and in some cases even death. This one topic could be a subject of books itself. One thinks of the suicide of Van Gogh and other artists (I use the term “artist” in the general sense, meaning painters, writers, composers,and other creative souls). The ability of the mind to concentrate should be developed. This is done through some form of meditation. There are many ways to meditate, but the number one goal is the cessation of the activity of the intellect, often accomplished with the aid of diaphragmatic breathing. The intellect can serve as a useful tool but it can also become reflexive and unstoppable, even addictive. The intellect can also serve as a means of alienation from life experience both emotional and spiritual, what psychologists call projection. The power of the mind to concentrate must be achieved from within. In many cultures an entheogen (a mind altering plant used in religious ceremonies) is used for this purpose. It helps to suspend the ego and allow the intellect to relax, opening the internal and external senses. This is what was meant by Aldous Huxley’s Doors of Perception, based on his experience with a cactus based entheogen. In Siberia mushrooms are used. In Mexico peyote and mushrooms are used, in the mountains of Peru it is another cactus, in the jungles of the Andes it is a vine. Christians use wine to evoke the spirit of Jesus. The use of entheogens can allow the individual to experience the cessation of the intellect, but it is only an introductory experience. The rest of the work must be done by the mind alone. Overuse of entheogens can damage the mind. Physical health must be good. This means a strong and healthy body and a good nutritious diet. The body is the repository of the mind, heart, and soul. It must support these things. A weak or diseased body cannot support the rigors of achieving an activated kundalini, or the rigors that follow. Also, the body must be balanced and in control by the individual. Coordination and dexterity should be good. Overall a strong constitution is important. A gentle heart and calm demeanor. Emotional balance and centeredness are very important. Psychological demons may at one time or another threaten all of us. It is best if there are no monsters in the unconscious. These serve as divergent distractions to the mind, which is otherwise trying to focus itself on emptiness and non-being to quiet itself. Powerful emotions demand attention. Such issues must be at rest for the mind to open to activate kundalini. A healthy and wholistic belief system, open to spirit. Belief matters. If the aspirant has a belief system that invokes fear at the possibility of self-knowledge, or has a belief in an ultimate deity of evil for example, or harbors the false notion of original sin, then said aspirant will find it very hard to reconcile the evidence of their senses with a dualistic model of the spiritual world. The activation of the kundalini leads one to Cosmic Consciousness and the experience of a unified creation of which one is a part. A dualistic model that posits an ultimate yin and yang cannot achieve the experience of being one with the Tao, for this experience has no duality. After achieving the aforementioned states of mind, body, heart, and spirit, one must find ultimate humility. This is not found through self-abnegation. Hair shirts and self-flagellation are only further manifestations of a misguided and ego driven practice. True humility brings the acknowledgement that we are no better than any other being. It is the exercise of letting the ego, which serves as a mirror of the self, be smashed in an act of ultimate letting go so that the true self beneath becomes evident. This state has been described as “The Dark Night of the Soul.” The feelings that are involved may be recognitions or revelations of aspects of one’s personal history that one may feel utterly humiliated to recognize. Yet these are a stepping stone to the ultimate release of the dragon at the base of one’s spine. Why? Because those feelings, however humiliating and painful to confess, are nothing compared to the effect of the kundalini. 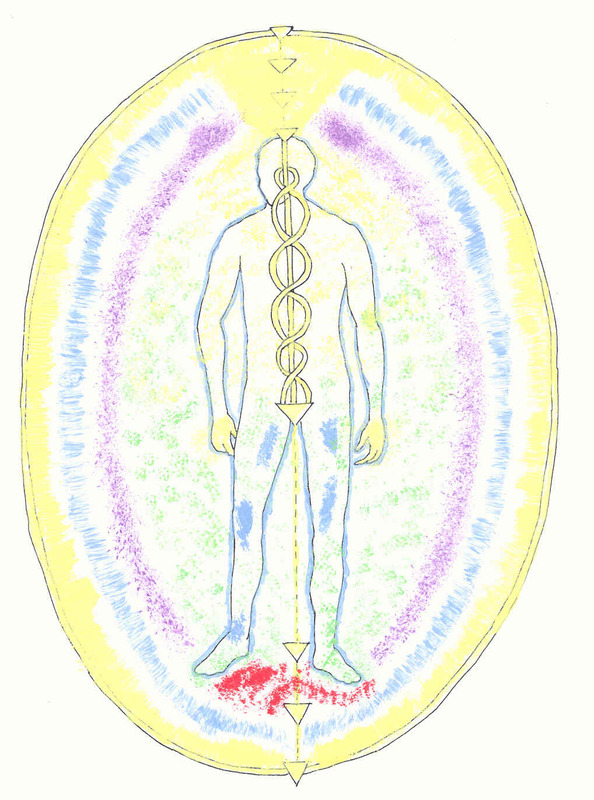 The kundalini, once activated, will reshape the entirety of one’s being. Only ultimate truth about one’s self, recognized at the base of one’s emotional being, can allow the kundalini to emerge. This is why a healthy kundalini activation cannot lead to evil, which is based on false beliefs and dualism. Having experienced the dark night of the soul, one must yet return to the meditative state and further plumb the depths of one’s being. Now one must face the lions that guard the gate. Whatever fears that lie dormant will now awaken. One must focus the mind in pursuit of the evolution of the self. This whole process is an evolution of the self towards a mystery that lies deep at the base of the spine. The readiness is necessary, for the power of kundalini is like no other. It cannot be achieved for selfish reasons. These are ego-driven motives that depend on falsehoods that are barriers to the true self underneath. Humility must be found, the humility that is simply the realization that we are all humble beings in this tremendous universe. It is our natural state and simply the truth. All glorification of the individual is predicated on false and ego driven thinking. If one follows this prescription, one can activate kundalini. For me, it was a moment of convergence of pressures and tensions in the mind, heart, body and soul that suddenly resolved into an opening of the channel at the base of my spine, and all those pressures disappeared, replaced by an ecstatic energy that rose up my spine, chakra by chakra. This kundalini energy mounted up to my brain and finally I was immersed in an ocean of cosmic ecstatic energy, a cluster of stars in which I perceived the stars while I was simultaneously the stars themselves. Following the activation and ascension to the highest state, I descended back into my body. I became aware of my surroundings and was back in my body, back in the room. But inside I had changed. My mind had permanently expanded and the energy of kundalini was loose in me, moving from point to point, changing me, transforming me into the being that I have become. I can compare my prior self to a caterpillar, and from the kundalini experience I metamorphosed into a moth or butterfly. The years that have followed, 42 of them, have for me been an adventure, a roller coaster ride of experiences. They have not been without ups and downs physically, emotionally, and spiritually. To be honest, one is well within the bounds of sensibleness to never pursue such experiences. The truths and insights are rich, but the experience is not an easy one. This life is approached in danger and experienced in danger. I was impelled to it like a moth to the flame. In my case there was a sort of inevitableness to my reaching this point starting when I was quite young. This is probably not the case for most. I would not advise pursuing kundalini activation unless one is truly inspired within to go there. It is a bit like being a high diver. It is not for everyone. It may be best to satisfy one’s self with gentle yoga and meditation, a happy family life and a pleasant society of friends and community. I don’t know if I chose this route or it chose me, but in any event it became my path. If you do feel that this is your way, then I offer the counsel above. Don’t be in a hurry. Don’t be ambitious. If you feel the wave drawing you in, ride that wave and stay balanced.